I'm currently designing a way to notify our customers of new features which we've added to our web app. The problem is most of our users don't use our web app, instead they consume our API. Currently we inform our users of new features via email, but the open rate is pretty low. We've now decided that we should design a notification that will be displayed on the web app. I have two questions. Firstly, out of the two designs, which is the better method to notify users? Secondly, should I surface the notification on the first page the user sees when they sign-in (any page), or should I surface it on the page which includes the new feature? I'm slightly concerned that if I place it on the page that includes the new feature it might get missed. Conversely it makes more sense to show the notification in context with the feature. I've seen similar questions posed, but I was unable to find any duplicates. Any help would be greatly appreciated. I've also thought about the new feature announcement in my company. First, every way of your company to contact users has to be used according to me (Facebook post, youtube video to show the thing, etc...). 1) You should ask them if they want some way to get introduced to the new feature. I mean, you got one, that's great, but now show them how to use it! If you don't, they could not understand what kind of need this feature adress to. Adobe XD Does video to do this with pratical example. Bonus point : Same example for EVERY video of feature you make (Shoopy, the shop for dog, show how this can use the new feature). So your users can create an emotionnal bond with your example. 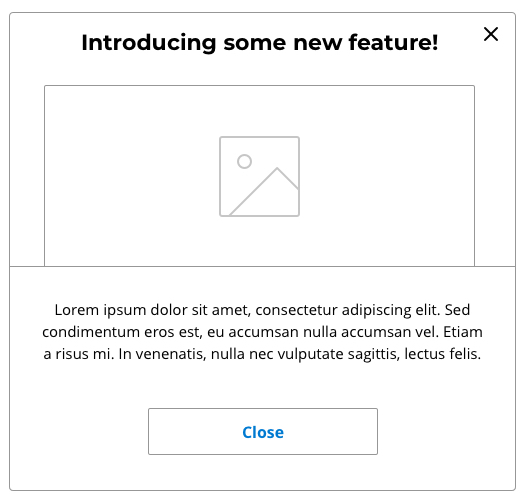 2) Take care about users that didn't come to your website since a long time : Do you want to show them every single new features one by one or do you want to show them those that they missed (like the 3 last feature for Jean and the 5 last one for Paul). I prefer the second choice, but you have to check with your dev if it's possible! And find a way to do it nicely. Not the answer you're looking for? Browse other questions tagged notification modal-windows or ask your own question. What is the best approach to informing users of new features on a web-based product? What's a good alternative to a modal calling another modal?